What On Thursday, April 25, Pedego® Palm Springs will celebrate the Grand Opening of the new Windmills location and the launch of a thrilling new eco tour where riders cruise near the giant windmills that produce power for hundreds of thousands of homes. 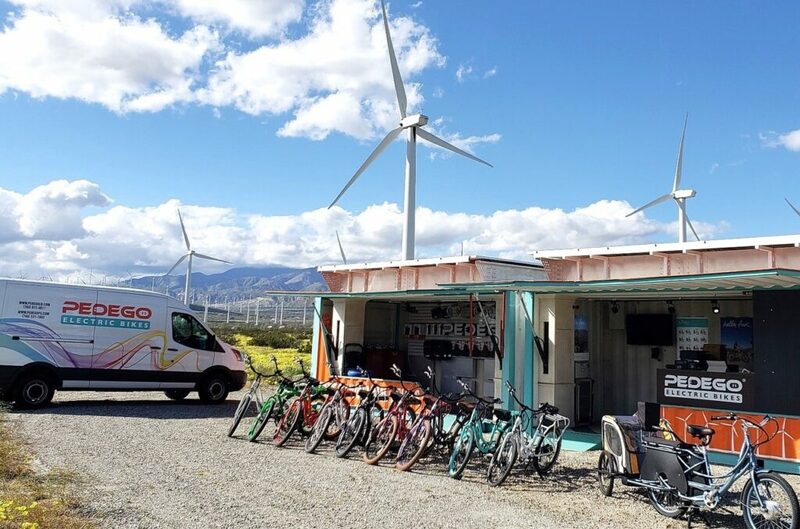 The event includes tours of the company’s off-the-grid, re-purposed shipping container store that relies solely on solar power to run the store and charge the bike batteries. Guests are invited to enjoy a free group ride at 1:00 p.m. Refreshments will be served. Why The Windmills Tour features Pedego Electric Bikes, the nation’s Number 1 electric bike brand, which enable riders to conquer hills and desert breezes as they visit the amazing feats of renewable energy technology. Paved paths allow Pedego bikes to cruise comfortably. The bikes are powered by renewable energy themselves, making this one of the most eco-conscious tours in the country. Pedego Palm Springs offers the city’s finest selection of Pedego electric bikes that flatten hills and make headwinds a breeze. Rental rates range from $18 per hour and from $70 per day. Its new guided Pedego Windmills Tour is available at $89 per person. Located in a solar-powered container off Route 111 near the windmills at 62950 20th Ave., Palm Springs, California, 92262, the Windmills location is open Thursday through Sunday, 9:00 a.m. to 5:00 p.m., for rentals, tours, sales, accessories and service. The staff looks forward to delighting visitors, beginning with free test rides. Riders can cruise along quiet streets all the way to Whitewater Wash, enjoying close-up views of the windmills as well as scenic desert and mountain panoramas. Please call the store at 760-537-7603 or email [email protected] for more information on rentals, tours or purchases. For photos and news, visit the website at www.PedegoPS.com. Visit Pedego Palm Springs under “PedegoPS” on Facebook, Twitter, and Instagram where you can check for upcoming specials and events. Visit the sister location in La Quinta, open year-round, at 78-075 Main St., Suite 104, La Quinta, CA.